The popularity of R is rapidly increasing and is well on its way to being a top 10 programming language. The TIOBE index is a standard indicator of the popularity of all programming languages. 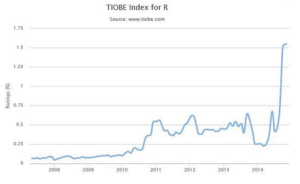 The TIOBE index confirms that a subset of languages – those for computational statistics and data analysis – are gaining increased attention. The clear winner of the pack is the open source programming language R.
The TIOBE index is updated once a month. The ratings are based on a survey of skilled engineers world-wide, courses offered, and third party vendors. Popular search engines such as Google, Bing, Yahoo!, Wikipedia, Amazon, YouTube and Baidu are also used to track internet activity by language and to calculate the ratings. It is important to note that the TIOBE index is not about the best programming language or the language in which most lines of code have been written. It simple tracks which languages are currently being used most. The index can be used to check whether your programming skills are still up to date or to make a strategic decision about what programming language should be adopted when starting to build a new software system. The definition of the TIOBE Programming Community Index can be found here. This entry was posted in Data Science, R Programming. Bookmark the permalink.